6.1 Introduction 6.1.1 The general situation and the Farkas algorithm 6.1.2 Update by minimal sums 6.1.3 Comments on "Belief revision with unreliable observations" 6.1.4 "Between" and "behind" 6.1.5 Summary 6.2 The Farkas algorithm 6.3 Representation for update by minimal sums 6.3.1 Introduction 6.3.2 An abstract result 6.3.3 Representation 6.3.4 There is no finite representation for our type of update possible 6.4 Comments on "Belief revision with unreliable observations" 6.4.1 Introduction 6.4.2 A characterization of Markov systems (in the finite case) 6.4.3 There is no finite representation possible 6.5 "Between" and "Behind" 6.5.1 There is no finite representation for "between" and "behind"
One aspect of common sense reasoning is reasoning about normal cases, e.g. a physician will first try to interpret symptoms by a common disease, and will take more exotic possibilities only later into account. Such "normality" can be encoded, e.g. by a relation, where case A is considered more normal than case B. This gives a standard semantics or interpretation to nonmonotonic reasoning (a branch of common sense reasoning), or, more formally, to nonmonotonic logics. We consider in this book the repercussions such normality relations and similar constructions have on the resulting nonmonotonic logics, i.e. which types of logic are adequate for which kind of relation, etc. 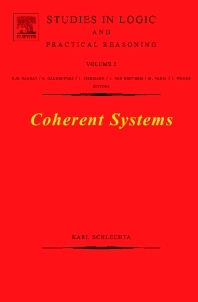 We show in this book that some semantics correspond nicely to some logics, but also that other semantics do not correspond to any logics of the usual form.